Home maintenance and construction products can sometimes bring out the worst in people. Ask your neighbors about jobs-gone-wrong. Everyone seems to have a story about a remodeling project that cost them dearly. You hire them. You pay them. They disappear before the job is finished. And they leave with a big mess in their wake. But it doesn’t have to be like that. Many flooring contractors are experienced, trustworthy, and will do a great job. They offer you a fair price and follow through on every promise made. How do you find them? Research. Never jump at the first “great deal” you find. Instead, step back and evaluate the offer. “Great deals” are most often a little too good to be true. And you’ll pay the price. A contractor that is easily offended by questions. A reputable contractor will answer every question you have and encourage more. They will be available before, during, and after installation to ensure you are fully satisfied. A contractor that is vague about licensing and insurance. If they can’t prove they have the proper credentials to be in business, they won’t have the protection necessary if something goes wrong. It’s not a matter of offending the contractor – it’s a matter of protecting your home. It’s your home, and if something goes wrong on the job, it could be you that pays the price. If an unlicensed contractor leaves you with a mess, your homeowner insurance won’t pick up the tab to correct the problem. A contractor that doesn’t mention moisture testing with hardwood installation. Depending on what hardwood you select for your home, it’s important to test your home’s conditions for proper performance. Wood should always be acclimated to your living space before it’s installed. If a contractor doesn’t discuss this with you ahead of time, don’t trust them to give you the best service possible. A contractor that pushes the sale. 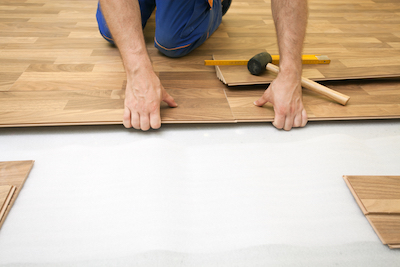 Installing new flooring should always be based on the best time for you. If they try and push it because a flooring is on sale, or there’s a reason to act fast, it’s better to let the “deal” go. A reputable contractor knows that new flooring is a big decision. This will be in your home for years to come. They won’t push or hurry you based on their desires for a sale. Instead, they’ll take their time to ensure the final flooring is right for you.